Tracy Dahl, CPS Technical Specialist in Renewable Energy and Appropriate Technology, attended and helped support the SAE Clean Snowmobile Challenge at Michigan Tech University in early March. This competition taps undergraduate engineering students to design and build low- and zero-emissions snowmobiles, and has yielded advances in the industry. He filed this report on this year’s highlights, challenges, and innovations. The 14th annual Society of Automotive Engineers (SAE) Clean Snowmobile Challenge took place in early March, and for the sixth consecutive year, the National Science Foundation’s Arctic Program supported the collegiate design competition. This annual contest challenges engineering students to produce efficient, less-polluting snowmobiles. No longer limited to two- and four-stroke gasoline-fueled engines, the competition saw two diesel-powered entries this year. Although not yet widely embraced by manufacturers, snowmobiles fueled by diesel have potential in the polar programs. A diesel engine machine actually won the lowest emissions award this year. Dynamometer testing is part of the complicated static emissions event. This monitor displays a wide range of parameters during the emissions monitoring test. The competition also has a “zero emissions” category. Thanks to the 2kW grid-tied solar system at MTU’s Keweenaw Research Center, the energy used over the course of the week by the battery-powered “ZE” sleds is now completely offset by renewable energy. These machines truly are now zero emissions. This year’s competition rules were rewritten to standardize the snowmobile design challenge with other SAE competitions. An Electrical Safety Form (ESF), initiated this year, required teams to describe how they adhere to the provisions of the rules, including detailed schematics. The technical inspectors reviewed the ESFs and came back with questions and suggestions on how to reduce potential safety risks and increase reliability. The mentoring process is a big part of this collegiate design competition. It may look a bit like a mechanical octopus, but the McGill team’s design ensures all high voltage components are effectively isolated, using primarily off the shelf electrical hardware. Despite these efforts, there were still a few surprises and significant attrition. Seven ZE teams were initially registered. Of these, five made it to the competition, and two made it through the technical inspection process to compete. It can be very difficult to tell a team that flaws in their design are too serious to allow them to compete when it is clear that they have poured their heart and soul into the effort. Yet the reasons are valid and the learning experience tremendous. In subsequent years, the teams will be better prepared. The Clarkson team was disqualified after judges deemed the wires that can be seen running across the tops of the batteries are ordinary speaker wire, which don’t meet the requirements for this application. 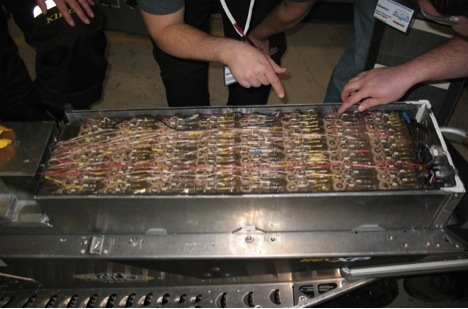 The Clarkson team hand-assembled an enormous 8kWh/160V accumulator consisting of 900 (yes 900) individual LiFePO4 cells. Modeling suggested the machine would have a 30-mile range. Unfortunately there were numerous problems, many of which were simply shortcomings in materials and workmanship. In this instance CSC officials decided not to let them start re-building this large and complicated battery at the competition and they were disqualified. It’s not all fun and games. Teams must present on their designs and are scored on a wide range of criteria. Here Gurdeepak Singh emphasizes a technical point as team captain Ali Najmabadi looks on. Some events, such as the combined acceleration/load pull shown here, were implemented to better simulate the utility type purposes the ZE sleds are likely to be used for. This is about an 800lb load, not dissimilar to loads that might be encountered at Summit Station. Here the McGill team makes a solid run. The 2kW PV array that offsets the energy used by the ZE teams can be seen in the left middle background. Even though they ran a very small battery this year, the University of Alaska, Fairbanks, team edged out a win in the drawbar pull event. A little snow did not hamper the objective handling event on Saturday. Although there were some dramatic moments in the “Cold Start” event for some of the IC machines, it was pretty anti-climactic for the ZE’s, which simply powered up and quietly pulled away. In conclusion, 2013 marked another excellent Clean Snowmobile Challenge. The event went as smoothly as possible thanks to the experienced guidance of co-organizer Jay Meldrum and his staff, along with the help of many volunteers. It’s not just snowmobiles. Every year it seems I learn about some other interesting things MTU/KRC is involved in. Here we see an old platform previously used in a fuel cell project, re-purposed as an autonomous vehicle platform. This technology could be useful as a GPR platform or for hauling gear through potentially dangerous crevassed areas. The challenges at the CSC are endless. Next year a new bio-fuel will be introduced, along with some additional rules changes. On the ZE side there is ever more expression of interest and we are already expecting a record number of entries. Although teams found it difficult to conform to the more rigorous rules and processes this year, by next year it will be the new normal and more teams will make it through to compete. In my opinion, the value of this competition goes well beyond developing cleaner, quieter snowmobiles. The education and skills honed by competitions such as this one help equip engineers to develop more sustainable technologies for life on our changing planet.